I am pleased to announce the release of a book that will enthusiastically be sought after by Jews who were not born Jewish, and those on the path to becoming Jewish. It has received glowing approbations from the Sudilkover Rebbe, Bostoner Rebbe, Hornsteipler Rebbe, Rabbi Yitzchok Meir Morgenstern, Rabbi Dovid Meisels, and Rabbi Lazer Brody. Unlike numerous books already published in English on conversion to Judaism, this book is not a personal narrative, how-to manual, digest of relevant laws, or academic historical overview. This book presents the story behind the story — the mystical teachings found within Chassidic literature that illuminate the hidden inner world of the ger. Until now, these teachings were scattered in an unorganized manner throughout countless volumes and inaccessible to those unfamiliar with the Hebrew language. 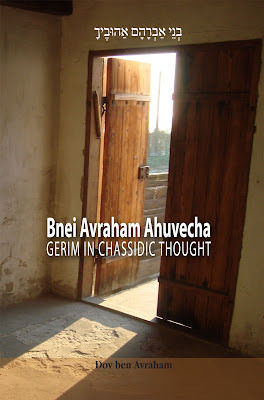 With this book, Bnei Avraham Ahuvecha: Gerim in Chassidic Thought, relevant Chassidic teachings are collected, translated from Hebrew into English, organized topically, and further elucidated, when needed. Interspersed with these translated teachings, stories- both old and new - are included to help bring them to life. In addition, this book includes supplementary essays written by Rabbi Chaim Kramer, Rabbi Ozer Bergman, Rabbi Dovid Sears, and Mrs. Talya Lipshutz (based on conversations with Rav Elazar Mordechai Kenig of Tsfat). Bnei Avraham Ahuvecha: Gerim in Chassidic Thought is now available for purchase online here. It is also available on Amazon.com here. Nice! Will it be available as an e-book (may be even DRM-free?). BS"D On this subject, I hope you can offer me some advice. As a ger, my command of Hebrew is limited. B"H I can read with no problem and I recognize many words in both my davening and learning, but the latter is slowed considerably by constant dictionary use and much time trying to sort out how a word is being conjugated. You mention in a recent post learning Degel Machane Efraim daily. Is your ability to do so insofar as the language is concerned something with which you grew up? I had assumed that you were a BT but maybe you learned as a child whatever skills I am obviously lacking, because eight years on I still struggle. Do you have any advice for me at all? Wow, very awesome! When and where will it be available? Mazel tov, mazel tov! Your own mama couldn't be any more proud of you than I am! This is a fantastic achievement! Mazal Tov!! I posted an announcement for the new book on my blog. Very excited to read it. Shmerl: I am not sure. Yoel: Please e-mail so we can discuss. Anonymous: Initially it will only be available online at the link in this posting and on Amazon. Moshe, Neil, Shoshana, and Damesek: Thank you SO much! I'd prefer to buy it as an e-book. I hope you didn't relinquish your rights to the book to the some third party publisher, since that would be unfortunate. If not, you can as well sell it as an e-book, and I'm sure it'll only attract more customers. Just don't do it in DRM way then, (that's a whole long subject why DRM is bad). Mazel tov, mazel tov. You didn't give up and here is this beautiful book (judging by it's cover). I am so happy that it is here. May the Schechinah dwell in the work of your hands. This looks wonderful! Thank you for investing so much effort in this, this will surely be incredibly meaningful and helpful to many people! Shmerl: I am will look into it. Smartelek and Yosef: I really appreciate the chizuk you have given me. will it be translated to ivrit? Friti: I don't have any plans to do so at this time. yishar koach! i hope this contributes to the struggle to lift up gerim from being considered second class jews as they often are in orthodox judaism. Yom Tov: A reader just left feedback on the Amazon.com site regarding this point. Chabakuk Elisha: Great to hear from you again! Mazel Tov- Sheyafutzu Maayanosecha Hachutza! Mazel tov, Mazel tov, Mazel tov. Just got this book. WOW! I am in the "process", taking my time and have a most wonderful guide/mentor, a Rebbe who I'm told is a great tzaddick. Nearly finished reading this book and can hardly put it down. I didn't realize how much other gers, and wanna-be's (like me) shared the soul longing deep inside to be Jewish. That feeling of never really belonging to the family in which you were born and always seeking where do I belong? It is amazing to me that historically Judaism supports and encourages gers who are sincere. Thank you so much for all your hard work in researching, etc etc, it must have taken to produce this astounding revelation (to me anyhow). Hope you will write more on this topic in the future. This book is really helping me to understand myself and why I've been seeking for such a long time and that I cannot turn back to where I came from, but must continue to pursue Orthodoxy and geirus, no matter the odds, no matter how hard, I cannot give up. May HaShem greatly bless you for this work!! Anonymous w/tenacity to reach the goal! I just put up a link to let more people know about the book. May Hashem bless you with success in everything. Anonymous: I wrote this book exactly for people like yourself. I am tremendously encouraged to hear that it has helped you so much. Rabbi Golshevsky: I can't thank you enough for the countless hours you devoted to my book project. Thank you helping to publicize it as well! I can't help to wonder how many of the rabbis who wrote the haskamot for this book would be happy to marry their children to a ger/gerah. The custom is to always pay lip service to the greatness of gerim, but when it comes to the tachlis of including them in one's family things are not so great any more. If I may add a comment to the previous Anonymous...They probably wouldn't marry their children off to someone of Sephardic, Litvish, German, or Teimani descent either, regardless of that person's tzidkus. It doesn't mean they aren't machshiv the other a great deal, but as far as shidduchim are concerened there are other factors to consider like particular mesorah. Also, the issue brought up is even more clearly emphasized by baalei yeshiva about whom it says, "bmakom shebaalei teshuva omdim ein tzadikim gemurim yecholim laamod" and yet the baalei yeshiva who married into rebbeshe families are few and far between. Where a person's neshama is from in essence does not necessarily reflect what they are about in this world, and hence, their suitabilty for carrying on a legacy of tzadikim and tehorim. I know that sounds condescending, but doesn't it make sense that the intrinsic value of the neshama of a ger tzedek or the esteem in which a complete Baal teshuva is held by Hashem may not be the only determining factor in producing further generations of tzadikim? To me (and I have geirus in my family on all fronts), it seems the question shouldn't be why don't they marry geirim, but why would they? Please edit "Baalei yeshiva" to "baalei teshuva" in my previous comment. Auto-correct auto-corrected. You can then delete this comment. Thanks!